The LEBEN farm lodge houses are located at Otoyo town in Kochi prefecture in Shikoku island, 800 meters above sea level where you can enjoy panoramic views of the majestic mountain range of Kajigamori and of Yoshino river. 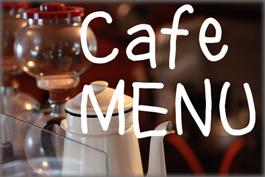 At the café, you can enjoy homemade cakes, coffee and fresh milk overlooking a captivating scenery. In addition, we provide a variety of farm experiences to the guests. For example you will enjoy the scenery of nature while harvesting organic vegetables, milking a Jersey cow, taking a cheese making class at our farm. In the evening you can relax comfortably in a Japanese traditional wood burning bath which you can experience preparing yourself . After that you can indulge with a barbecue dinner (using fresh beef from our farm and home grown vegetables), and end the day enjoying the wonderful starry sky at the terrace. By the time you leave here, you will find yourself filled with energy. fresh air, delicious food and experiences that will last you a lifetime. Our guesthouses are located 6 km from Toyonaga JR station in Otoyo town, 90 minutes drive from Kochi city. We can pick you up from the Toyonaga station at no extra cost. Map Link. For bookings and more information please mail us at info@otoyo-leben.com. 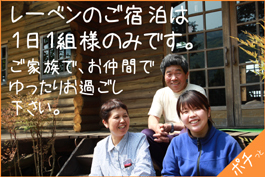 You can chose to stay at one of our two lodge houses, Leben, a wonderfull 1 bedroom wooden lodge house or our newer and bigger 3 bedroom lodge, New Leben, both of them in the same area, enjoying the panoramic views of the Shikoku mountain side. 1, New LEBEN accommodates up to 8 people and LEBEN accommodates up to 6 people. 2, Sometimes meals are not available so please check with us in advance. 3, We accommodate only one group a day for a log house. 4, Dinner is barbecue style. We would like you to help with meal preparation and cleanup. 5, Please bring your own towels, pajamas, toothbrush, etc. 6, Please come to LEBEN heading to “Kajigamori”. We are on the way to “Kajigamori”. Please drive carefully as the mountain road to here is quite steep. 7, There are some insects here like bees, Abus, and mosquitoes especially in the summer. You may feel chilly in the morning even in the summer as we are located in the mountainside. 8, LEBEN is twenty years older than New LEBEN and you will have to burn the wood on your own to prepare the bath. 9, Please bring back your own garbage as we have limited access to the garbage truck. 10, Farm experiences like cheese making classes etc. come at an extra cost. 11,Please bring alcoholic drinks and juice if you need. Kajigamori Mountain stands at 1399 meters in Otoyo town in Kochi prefecture. It has been particularly popular, visited by many people since long time ago. 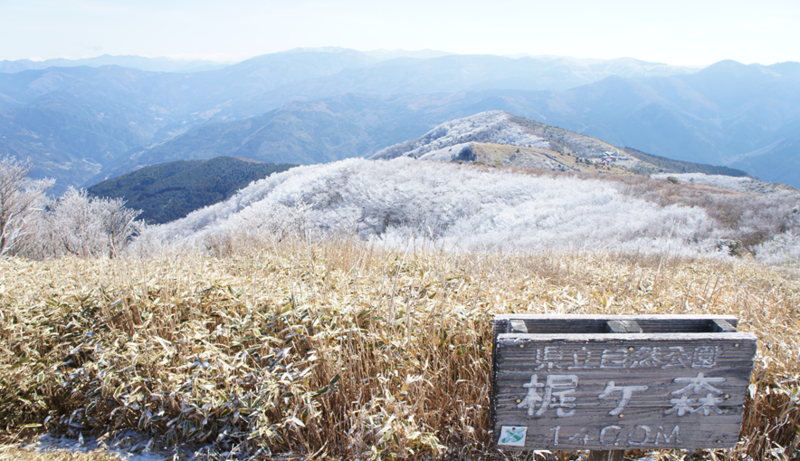 You can drive to the summit by car, though the mountain’s spectacular nature is best enjoyed when hiking to the top. Located at the foot of Kajigamori, Ryu-oh-no Taki (Dragon King Waterfall), is one of the 100 selected waterfalls in Japan. The scenery is captivating with crystal clear water dropping 20 meters from a huge rock surrounded by ancient cedar trees creating a serene and cool environment even in the summer. Once upon a time, in a village in the Sagayama area downstream of the waterfall, a beautiful young woman seeks to lodge in for the night. A host accepted but he was asked by the woman not to check her room during the night. However being suspicious and curious, the host broke his promise and looked into the woman’s room but to his surprise instead of a woman he saw a big serpent. The next morning the woman thanked the host for his hospitality and left. The host followed her, only to realize that her journey ended in the waterfall. After that the host fell seriously sick. 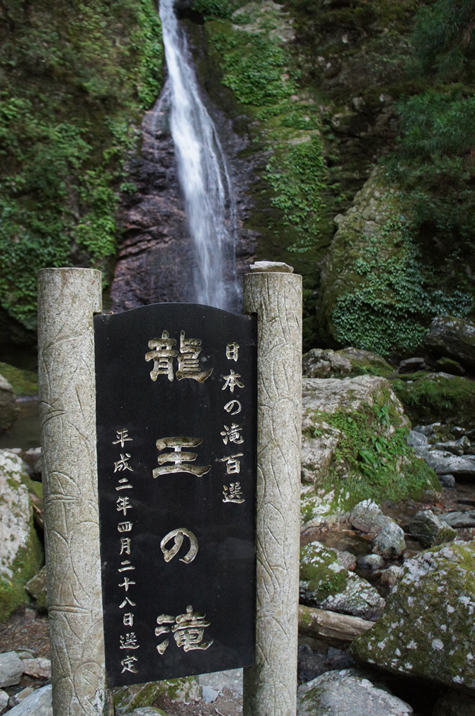 The legend was created that the serpent woman is the spirit that lives in and haunts Ryu-oh-no Taki ( the Dragon King Waterfall). 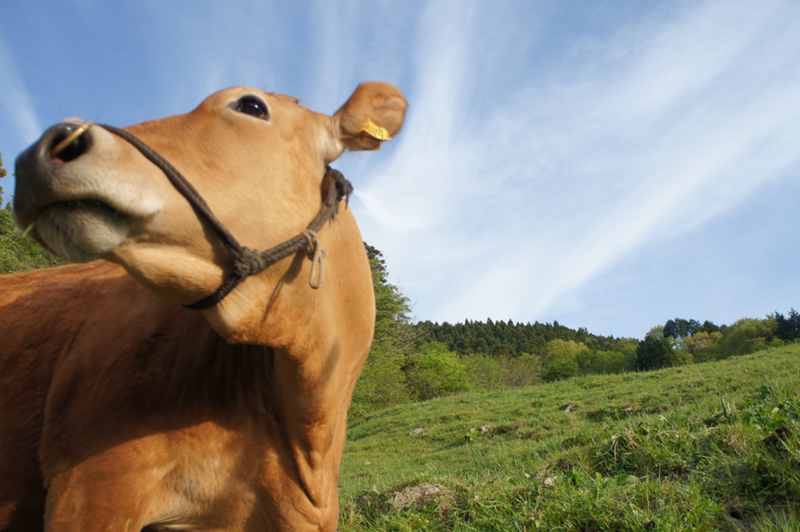 Tosa Red Cow is a rare variety of brown colored cattle that is bred in the mountain side of Kochi prefecture, with only 500-600 animals being bred every year. The breed is a cross between the Swiss Simmental cattle and a Korean breed, and were first imported as ploughing animals in the middle of Meiji era (late 19th century). Tosa Red Cow is suitable for the Kochi environment with plenty of sunlight and abundance of steep slopes on the mountain side. As agriculture was being industrialized and cows replaced by machines, the breed was being developed for its meat and in 1944, it was certified as a Japanese beef cattle (Akagawashu).